It started on the first of February, with what sounds like artillery a few kilometers out. Then coming to a head on the 2nd it was if the city exploded. Earlier that evening, tensions were getting stronger. 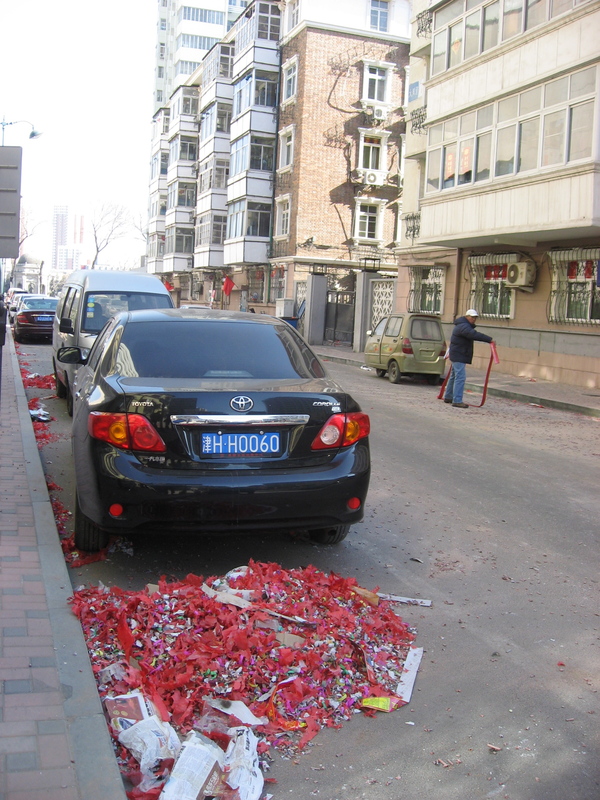 Litter was visible throughout the streets from the explosions, and through the evening fireworks could be seen going off across the rooftops of the Hutongs, and reflected in the glass skyscrapers and high-rise apartment buildings. Just after midnight the background noise suddenly exploded into the foreground. Pulling apart the blackout curtains just after midnight, I was amazed to see the entire city aglow. Car alarms could be heard up and down the streets, and the neon signs and monster LED displays that normally seemed so bright paled in the fluorescence of this new light. This, my foreign friends, is New Years in Beijing. Now standing at my window, I counted no less than 12 (possibly more) individual displays of pyromania, taking place in various parts of the city – none of which seemed to be from any kind of safe distance from built up structures or thoroughfares. Over this holiday season (and it is truly a season, as fireworks have persisted throughout the day and night for the last week) a 5-star hotel burned down in Shenyang, a city further north of Beijing. A news article (see picture above) said that no fewer than 160 small fires were reported across the city over the New Year (how big is a ‘small’ fire exactly?). Apparently all this is just the price one pays for the excitement and reckless abandon everyone enjoys during the biggest of the Chinese festivals. The amount of gunpowder that goes off during the week of New Year is simply amazing. Fireworks aren’t just something for the night, or evening. Strings of firecrackers are set off early in the morning, and fireworks can be heard and faintly seen throughout the day. For the last few days as we’ve walked around the city, we’ve seen red paper from firecrackers and powder burns from explosions everywhere. While the rest of the world slowly chokes out fancy firework shows with regulation and pleas of humanitarian injustice (why spend thousands on fireworks when there are still starving in Africa?) China burns renewed with the celebrations of the Lunar New Year. It’s quite astonishing every kind of colorful and explosive shell seems most permissible here. Fireworks that would be labeled “for professional use only”, and not even be for sale for most of us unless smuggled in from Mexico, Beijingers light and enjoy in the intersections of major roads (while cars merely pull to the side, or seemingly ignore them altogether). And this in the cement jungle that the second largest city in China. Because of the holiday the traffic has improved tremendously. 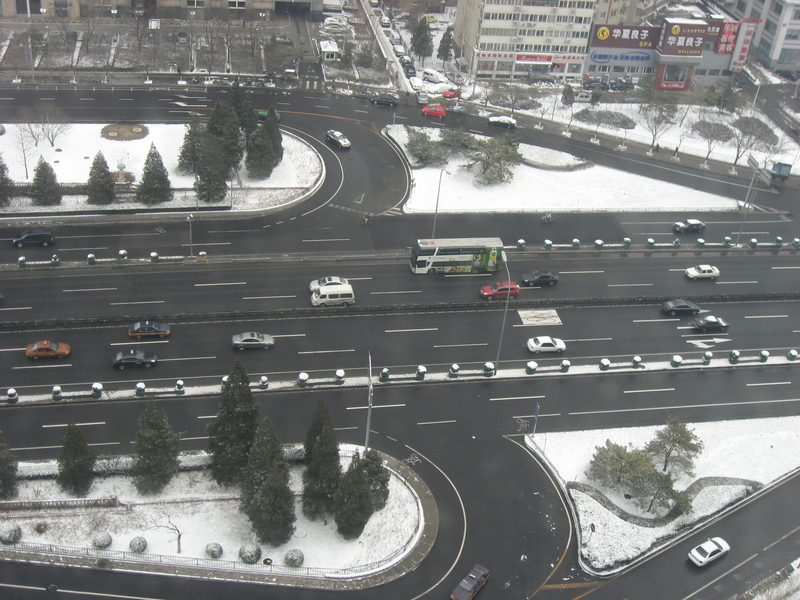 Generally there is stop and go traffic generously spotted all around Beijing, from 7:30 in the morning to about 9 at night – the Ring roads, (the 2nd Ring rd. in particular) being the worst of it. Over New Year, however, there is a mass exit when everyone returns to their villages and families. The city becomes a ghost town for a week – and it’s wonderful. If you don’t mind the cold, this could very well be the time to visit. Except most of the normal markets and shops are closed, or close early. If you’re a culture kind of person, and less of a shopper, think about planning this trip for next year. I've recently moved to China (again, after a short stay last year), with the intent of a more long term, but ultimately impermanent a stay. For the interest of those who might wonder what day-to-day is like in China, I’ll try my best to return to relating my thoughts on life as an ex-pat. Wok Around China and all accompanying pictures are licensed under a Creative Commons Attribution-Noncommercial-No Derivative Works 3.0 United States License. If you take a picture - just link back to me. I'd do it for you! Thanks.